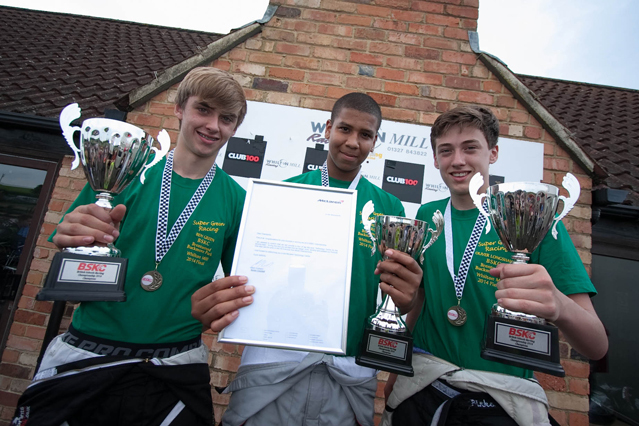 DPHS Super Green have been crowned 2014 British Schools Karting Champions following a pulsating National Final at Whilton Mill. More than 350 three-strong teams  constituting over 1,000 budding Lewis Hamiltons and Jenson Buttons aged between 13 and 18  entered this years hotly-contested BSKC challenge. A knockout-style series of local and regional heats reduced those teams to just 29, leaving the fastest young hotshots in the country to travel to demanding Northants circuit Whilton Mill to do battle for the coveted BSKC trophy behind the wheel of the tracks fleet of new Sodi arrive-and-drive karts. The heavens opened at the start of the day, meaning the first five races took place on a wet track  adding another dimension to what was already an enthralling showdown. The circuit dried out again in time for the last three races, and a series of exhilarating wheel-to-wheel duels yielded victories for Winterbourne International Academy (twice), Warden Park Academy A, King Alfreds Academy A, TBSHS A, Heart Of England School (twice), Debenham High School A, DPHS Super Green and Caterham A. Ultimately, it was the sheer consistency displayed by DPHS Super Green  composed of 16-year-olds Ben Green and Oliver Longshaw and 15-year-old Jaiden Fenton, all from Debden Park High School in Essex  that won the day. Four top three finishes proved sufficient to see off closest rivals BUMPS A (Bransholme Urban Motor Project, Hull) and Bristol-based Winterbourne International Academy. Defending BSKC Champions Heart Of England School wound up just shy of the overall rostrum in fourth, with fellow former title-winners Hutchesons A placing ninth, Altrincham Boys Grammar A 14th and Caterham A 16th. Debden Park High School made their BSKC debut in 2013 under the DPHS supported by Sytners Mini banner. Twelve months on, DPHS Super Greens path to the National Final came courtesy of triumphs at Brentwood Karting Raceway and Buckmore Park. The champions prize is a money-cant-buy trip to the state-of-the-art McLaren Technology Centre for the team and team captain (teacher/parent). Jaiden Fenton hailed an unbelievable result that had left the whole team and its throngs of trackside supporters feeling extremely proud. What a superb days racing to conclude the eighth edition of the BSKC, enthused Mark Turner, manager of the popular and successful British Automobile Racing Club-run championship. This National Final was the culmination of several months of spectacular on-track action  to say nothing of a great deal of dedication and commitment from all of the competing teams. 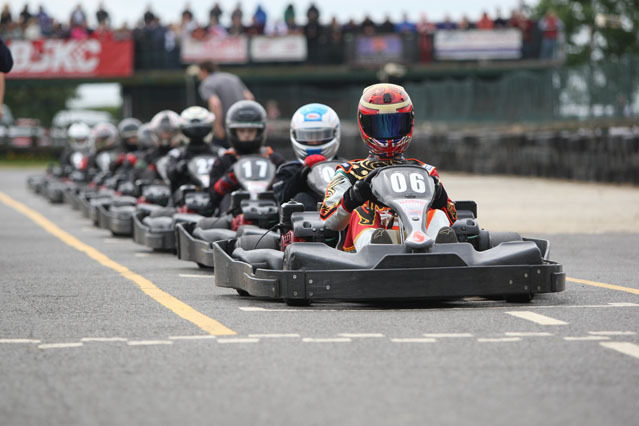 When the starting lights go out at Whilton Mill this weekend, 29 teams will go head-to-head and wheel-to-wheel for the honour of being crowned 2014 British Schools Karting Champions  and the battle promises to be fierce. More than 1,000 budding Lewis Hamiltons and Jenson Buttons aged between 13 and 18 signed up to participate in this years BSKC challenge. A knockout-style series of local and regional heats have whittled down the competition over the last few months so that only the cream of the crop  the fastest young guns around  now remain. The 29 teams  counting the four most recent BSKC title-winners amongst them  will face off against each other on Saturday (19 July) at popular Northants track Whilton Mill, one of the most demanding circuits in the country and a staple fixture on the British karting calendar. Practice sessions will pave the way to the races and ultimately, the eagerly-anticipated coronation of the 2014 BSKC Champions. The weapon of choice will be Whiltons fleet of new Sodi arrive-and-drive karts, and each three-strong team will enter six races  two per driver  of which the best five results will count towards the overall tally. The champions money-cant-buy prize will be a trip to the McLaren Technology Centre for the team and team captain. The 2014 BSKC National Final contains all the ingredients to be a thriller! enthused Mark Turner, manager of the British Automobile Racing Club-run championship that is now in its eighth successful year. As ever, the calibre of teams and quality of the racing have been of a tremendously high standard  with some superb battles all around the country. The 2014 British Schools Karting Championship is now open for teams to register. The local stages of the competition will take place between 10 - 28 March. Registration will be open until 21 Feb but teams are recommended to book early to make sure that their place is guaranteed. Now in its eighth year, the BSKC offers students aged 13 to 18 the opportunity to take part in an exciting, nationwide knockout karting competition that does not require previous experience, equipment or substantial expense. As well as the overall BSKC champions, regional champions will also be crowned for teams competing in London & South East, South West, East of England, Midlands, North East, North West, Yorkshire & Humber, South and Scotland. The total cost of entry for the BSKC is £165 for a team of three students (£55 per driver). This includes the use of all equipment, a practice session and entry into the local heats and regional finals if the teams make it that far.